The box is a Hammond cast aluminum. 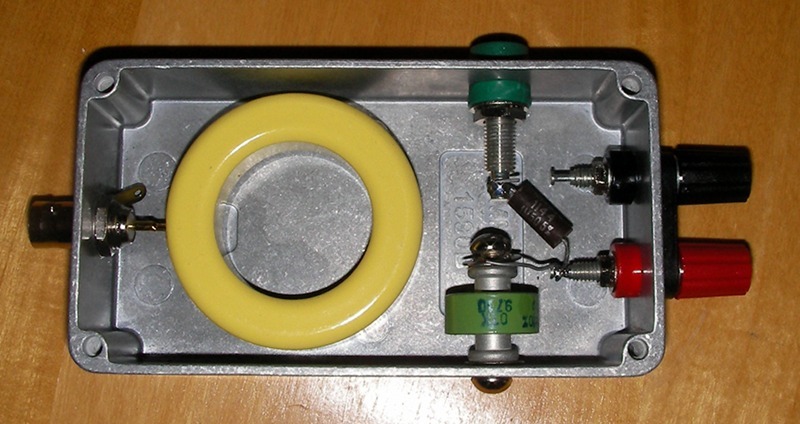 The capacitor is a 100pF 3500V doorknob type. I could have used a cheaper ceramic disk type, but you know me by now.. The resistor you see there (black) goes to an isolated ground plug for use with a weather balloon or kite (1.5M 3W). When connected to the earth, it bleeds static electricity to the ground to avoid frying the radio (thousands of volts). I though about connecting grounds together via wires, but the box does that well.. The optional counterpoise (we'll see about "optional" later.. (0.05 WL, about 13ft)) binding post (black) is electrically connected to the box, while the antenna wire post (red) of course is isolated. The magnet wire is 18ga. Opinions? After testing I will pot it with liquid rubber... I did some preliminary testing with a 135ft wire strung around the house and got a 3:1 SWR; just enough to send my call sign and "testing" in CW of course. I very rarely use a microphone.. Higher up the band the SWR goes up, so the antenna is a bit too long. Having many turns at weird angles and a house with all it's wiring around it of course doesn't help. Once stretched outside I expect it to work great. I will post an update. Now I'll be able to check in CW nets on 80m! Re: An Enf-Fed Wire Antenna for 80m. I love end-feds and this looks nice! Defenitely QRO. I just ran some numbers and it is good for well over 100W. At 100W the losses in the core are about 2.5W (97.5% effeciency) and at 10W are < 1/4W. Voltages at the output end are high as you know. I would add insulation between the wires and the metal box. Magnet wire enamle isn't that durable. I think you are taking a chance by potting it in rubber (or anything). Filling the air voids around the wires will increase the capacitance between the wires and core which will reduce the tuned frequency. You may get the center of its bandwidth just right and then have it shift lower after potting. I would just tack it down with 4 blobs of RTV. I figured that on 80m, losses can have an impact. Not like on 20m.. The band is noisy and every bit helps. I might have to rethink my potting plans then.. Maybe something closer, like closed-cell foam. My idea was to find some kind of mylar for extra insulation between the coil and the case. Re: An End-Fed Wire Antenna for 80m. Gil, VK5ZVS has a nice page there, but I'm biased because I like end-feds. Before trimming the wire, consider tuning the transformer. Though VK5ZVS found 100pF made a perfedt 3.59MHz resonant circuit with the transformer, those cores usually have +/-20% tolerance specifications. Plus, how you wind the wires on the core will change the inductance and stray capacitances. If you have an antenna analyzer or o-scope I would put a 2K resistor across the output and sweep the input to see if you get a peak at the frequency you want. If not, add or remove a turn or crowd or spread the windings. The antenna will work much better with the coupler resonating at the same frequency as the wire. Yes, thank you. That is why I took the risk of using a fixed capacitor. I was hoping moving the loops on the core closer or wider would give me a little leeway. I have not been able to stretch the wire out yet to test it properly. I could stretch it a few feet off the ground on the street, but I suspect the proximity of the ground would mess things up. So, I will have to wait that I can find a tree to shoot the wire up to, and probably make an inverted V at about 50ft top, the maximum height of trees around here. I might find taller ones when I go camping. I think 50' is reasonable for testing and will probably be the most common height available in the field. It is at my house for that matter. How do you get the 2K impedance? Wire is 26AWG, 134ft. Copper-clad steel. The purpose of the resistor is to simulate the impedance of a perfectly tuned (purely resistive load) antenna, but its value doesn't matter too much for finding resonance. Opinions vary on what the feedpoint impedance of an EFHW antenna is. I've seen/heard of everything from 1.5Kohms to 5Kohms. For the 40M - 15M ones I've done I find the antenna's impedance is around 2.5K so I use a 7:1 turns ratio. Zooming in on VK5ZVS's pictures it looks like he used 2 resistors adding to 5K for the variable capacitor test setup, so maybe he's expecting 5K for the 80M wire. 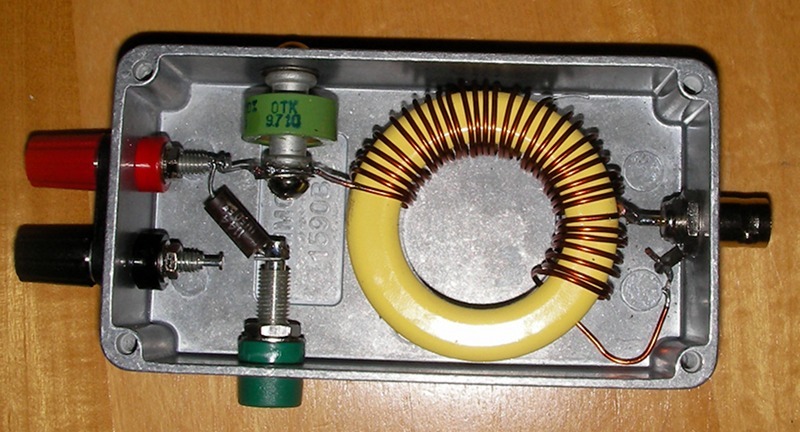 The favorite one I made uses a broad-band transformer and no capacitor. With a 65' 3" piece of insulated wire it's a great 100W antenna on 40M and 20M, a good one on 15M and there are useable portions of 10M. It's pretty small and there's no tuner or anything to adjust when switching bands . As soon as I get the taxes done I'll see if I can't write it up and post it. ETA: I take that back. As soon as I get the taxes done I'm going to shrink it and make a tiny 10W version. Well, looks like I'm on 80m now, kinda... I shot up a wire over the house and the trees, and ended up with a half-wave wire in a shape I would call a "shortened inverted U." SWR is 2.4:1 on 3560. Not great, but useable. I suspect it would be much better with a straight wire. I used a 13ft. counterpoise. No tuner. So, who's going to call me on 80 tonight, CW? I have a 180' long wire in an inverted-L and a tuner that forces it to do 80M pretty well. What time & freq? Heh, that's funny; I was on 3562 which is where the TENth Region traffic net meets. Millions of freqs but small world! Sorry I stood you up. I ended up working at my desk until 7:45, then dinner and family. Now I'm printing the VE manual because our club is giving a license-in-a-day class tomorrow and with my brand new VE badge I'm going to help. I figured while the students are studying I'll review the manual so I'll actually know what I'm doing. No problem Bob. I have some SWR issues anyway.. Probably not a good idea for me to transmit at this time.. Since you're into CW, you'd be SUPER welcomed into the National Traffic System. Florida is just a hotbed of traffic handlers as is the entire 4th Region (Virginia down through Florida). but that info is 8 years old now, so it might not be accurate, time/freq - wise. Still, it's worth a shot. If you pick up something (strange Q-signals or whatever) that you don't understand, just ask here. Thanks Luck, I will definitely listen to those frequencies..